Last weekend was my first time being away from Little A for more than a few hours, and my husband’s first time taking care of Alec on his own for such a long stretch. I had no qualms about leaving them though – I knew they would have a fabulous time together. And for the most part, I managed to resist the temptation to set things up for them (I did make sure all the laundry was done so there would be no missing-pj-emergencies, and that the fridge was reasonably well-stocked with both of their favorites, but I didn’t pre-make any meals or similar). 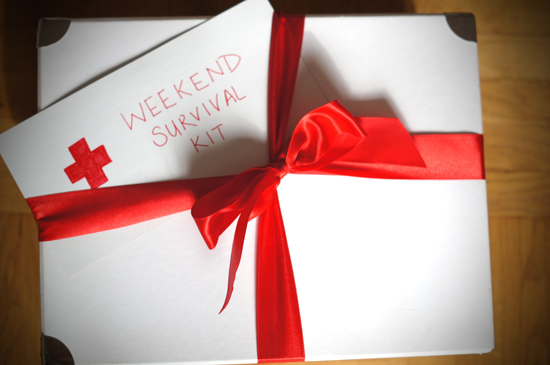 What I did do was put together a fun Weekend Survival Kit for my husband, stuffed with goodies that I hoped would make the weekend fly by. A bag of dark chocolate pralines and truffles from our neighborhood sweet shop for Dad. In case of difficult bedtimes, or to celebrate a job well done! Adorable! I love it from envelopes to elements! I hope it was a very special weekend for them, as well! Thanks Gina! They had such a good weekend – they always have a great time together!